Need help with green energy? 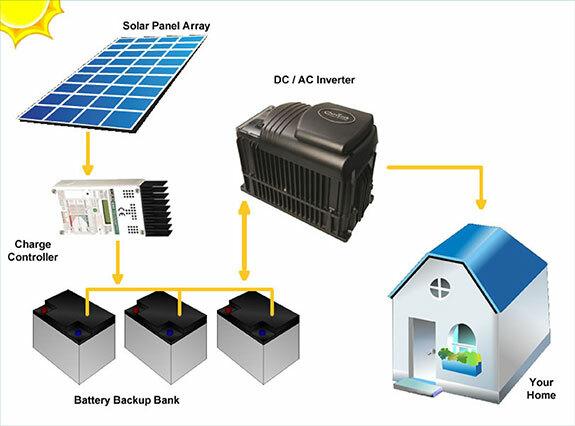 We are experienced installers of renewable energy solar powered electrical systems. MountainAire Builders staff live in an off grid home at Keyes Point from April through November yearly. Their home has one of our solar/battery/inverter systems installed that provides 60 amps of clean sine wave 230 volt energy. Our builders are able to live FULL TIME in their home powered by clean, renewable solar power provided hassle free and easy to use. This system provides electricity very similarly to what you are accustomed to at your home in town. During installation we program the inverter and charge control to make this a very SIMPLE to use system. The home is equipped with all the comforts of a city home- full lighting and receptacles throughout the home (just flip the standard wall switch for lights 24/7), continuous pressure water system operations from a submersible 230 volt pump, large refrigerator with water and ice in the door, under counter dishwasher, washer/dryer, upright freezer, microwave, coffee maker, toaster, bathroom vent fan, computers, printers, TV/DVD player etc. There are no problems running battery chargers, an air compressor, a hair dryer or other common consumer high voltage electrical equipment. These electric powered devices run any time at will as needed, similar to your home in town. There is no complicated flipping of switches, no need to "go out and start the generator" multiple times a day, or any of the other hassles associated with old style off grid cabin power systems. The water is ALWAYS on (hot water is ALWAYS instantly available), the lights are ALWAYS ready for use, the fridge and freezer is ALWAYS cold, the microwave is ALWAYS ready to use, turn on the coffee maker ANYTIME you wish, the furnace can run anytime the thermostat says it should, the internet is always up and running (with our dish system and satellite service), even laundry is easy, just load the washer and dryer, hit start and go on with your day(even if it's away from the cabin). The electricity is ALWAYS on and ready for use. In fact, you can leave your cabin vacant for weeks at a time, with food still in the freezer and fridge, it will be cold when you visit again.